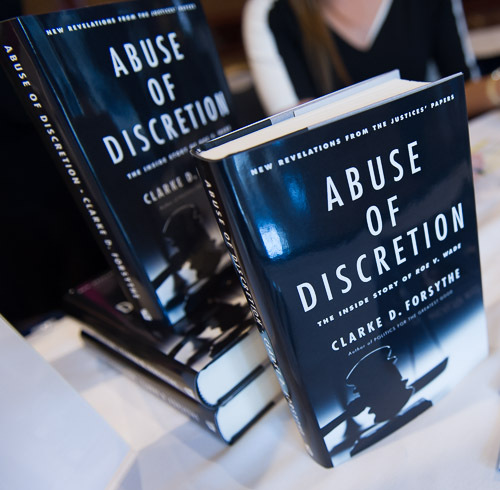 I was asked to photograph the book launch of 'Abuse of Discretion' by Clarke D. Forsythe at the National Press Club in Washington, DC on October 2, 2013. I had a brief chance to talk to Clarke, he seemed to be a very bright lawyer and very passionate about the topic of his book which looks at the behind-the-scenes deliberations that went into the Supreme Court’s abortion decisions from 1971 to 1973. The room that the event was held was packed and they were videotaping the event. 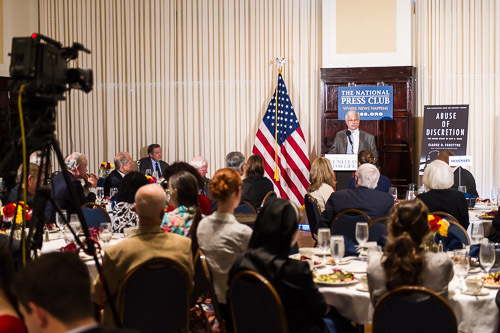 Whenever I photograph an event that is being videotaped I try not to use flash because it screws up the video cameras. Fortunately, the video company had brought plenty of lighting so that wasn't a problem. As with most events I photograph, I used two cameras, my Nikon D4 and my Nikon D3S. The D4 had my Nikon 70-200MM F2.8 and the Nikon D3S had either my Nikon 24-70MM F2.8 or my Nikon 14-24MM F2.8 lens. Between the packed room and trying to make sure I wasn't in the video, it made walking around the room a little tricky. I try to move around a venue like this to get as many interesting angles as I can.